We hear it all the time as we listen to business podcasts, reading books or blog posts: delegate, delegate, delegate. But as a solopreneuer, I don’t have that luxury. And since my business isn’t yet at a place to hire a VA, I’m left to do ALL THE THINGS (not really. Some I just decide not to do.). I have a running joke with myself that I hired a personal secretary, and she works these certain hours, and her name is Joy (that’s me. Get it?). Chief Everything Officer. 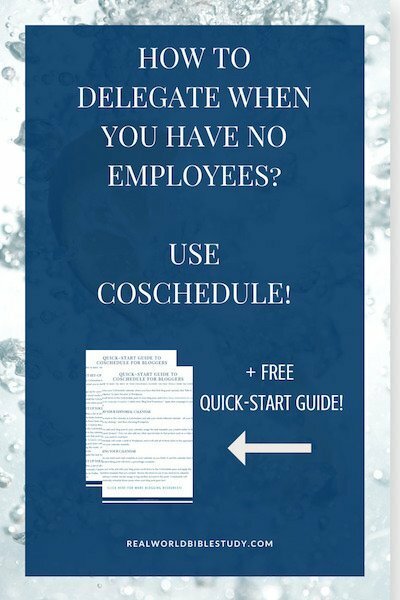 I use CoSchedule to delegate and allow me to be active on social media without having to be constantly in social media (which simply wouldn’t be possible since I work a full-time “regular” job!). If you’re interested in building your blog business, check out my favorite tools to grow your blog business! This page contains affiliate links – they sure help to pay off those student loans! For more information, please see my disclosure page. Also, as you’ll see below, I’m getting a discount from Coschedule in exchange for my review. 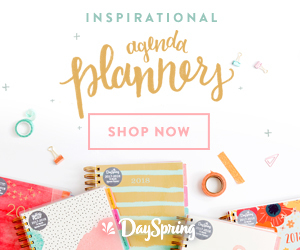 Think editorial calendar + social media scheduling tool + marketing assistant. I was introduced to CoSchedule through the awesome Headline Analyzer tool, which I’ve been using for several months. I was scheduling my social media with SmarterQueue (and had no complaints about their service). I’ll admit it; I was won over to the free CoSchedule trial by the referral program. On the Essential plan, each paying customer you refer gets you 10% off your subscription. And (BIG DEAL COMING), if you write a review of the service, you get 50% off. As a startup business owner, I need to keep my costs down. It was worth trying something new for the possibility that I could eliminate that expense by writing a review and get a few referrals. Great return on investment, right? 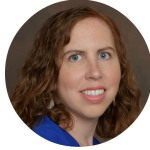 Once I met CoSchedule “for real,” I fell in love. You can use Coschedule via the web browser or the CoSchedule plugin on your WordPress site. I was a little concerned about adding a plugin since some of them can be bulky and slow down your site, but I haven’t seen any issues since adding the CoSchedule plugin. 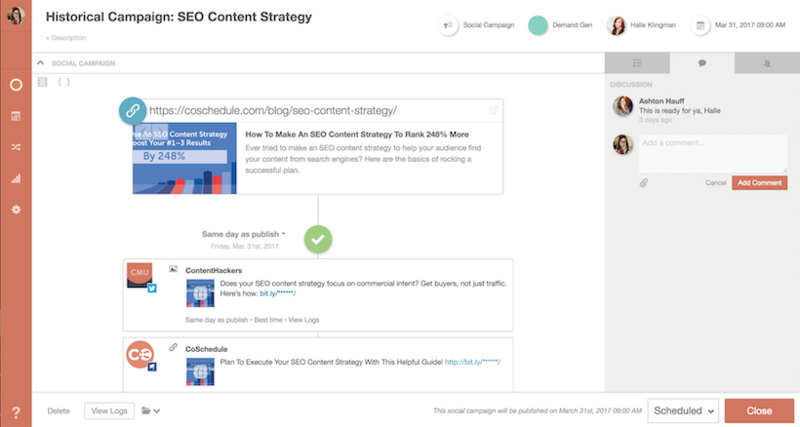 Once you’re in, you can add your whole editorial calendar, but you don’t have to do it piecemeal. Templates for tasks and for social campaigns keep you from doing tons of extra work to schedule everything out. You can see your posts across several channels in one place. You can also tie your social campaign to a blog post so that you don’t have to wait until that post is live to go schedule everything. If the blog post goes live, the automated sequence kicks in. 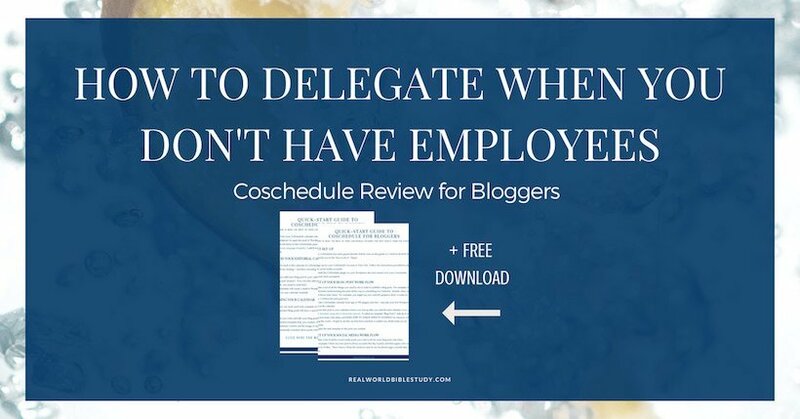 When you use CoSchedule as a solopreneur, instead of delegate, delegate, delegate, it’s automate, automate, automate. Does Scheduling Social Media Hurt Engagement? Nope. For me I’ve seen the opposite. If you only schedule, that would hurt, because there would be no conversations, just one-way traffic. But I schedule in advance, which frees me up to just engage by responding to comments when a post goes live. It puts a serious dent in the amount of time I need to spend on social media to run my business, which is really important because, again, I have another full-time job, so posting to Twitter or Facebook all day just isn’t an option. For my own content, I created a task template with all the things I need to do to get a blog post out the door, and when I want them done in relation to the date the blog post would be completed. (This was a tip from my assigned Coschedule Expert, Brock. He took a look at my calendar and told me how I could use it more effectively. Thank you, Brock!). I add my blog posts into the CoSchedule calendar (which creates them as drafts in WordPress), and then I attach that task template to the new blog post. All those associated tasks are instantly scheduled and will adjust if I move that post to a different date. Then, when I’m actually done writing the blog post, I use a social media campaign template I created, with all the posts I will want to send out when a blog post goes live. I have posts going out to different networks on the day the post goes live, and days, weeks, or months later. 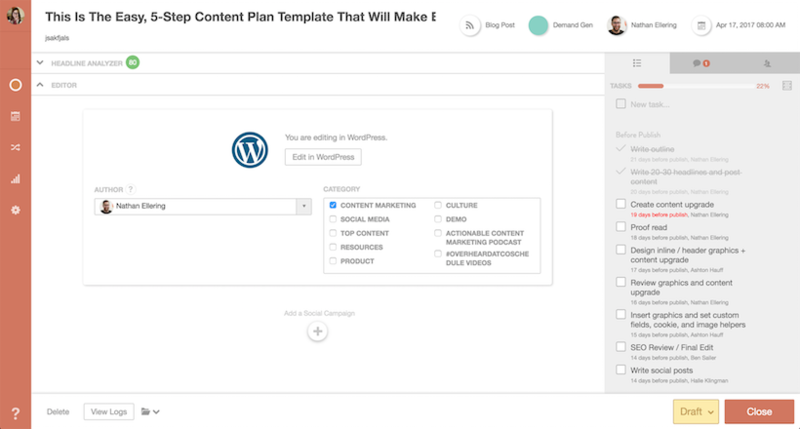 I attach that template to the blog post – right within WordPress – review the social campaign to make any tweaks, and then schedule the blog post. When the blog post goes live, the social campaign starts running its course. As bloggers, part of how we serve our people is by sharing great content from other bloggers. When I spot something I want to share, I use CoSchedule’s web browser extension to capture it and add it to a ReQueue group. Make any edits (I like to tag the person whose work I’m sharing, for example), and schedule it. Those posts will automatically be fit into the right slots on my schedule, and the post will be queued back up at just the right time. I get it. Running a blog business seems to be one monthly or yearly expense after another. But if you’re like me, you don’t have the time to do everything manually. I have a full-time day job. If I do all the manual work on my site and social media, I won’t have any time for the work I love that made me start this business. I won’t be able to do the strategic things to make the business grow. On the other hand, if I leave out the social media strategy, the business won’t grow. So I figured that paying $49/month (cheaper if you can pay annually!) is much, much cheaper than hiring a virtual assistant. And, I mentioned CoSchedule’s great referral program above! Right now (August 2018), if you write a review post you can get 50% off for a year. You will also get 10% off for each person you refer. If you think you might be able to use CoSchedule to grow your business, sign up for the free 14-day trial to test it out. To make the best use of your time, I’ve made a Quick-Start Guide to CoSchedule for Bloggers. You can access it for FREE below. Enjoy! « Does Going to Therapy Make You a Bad Christian? I had never heard of CoSchedule before, but it looks like a super helpful tool! I like that you can automate the social media sites to start posting once the blog post goes live, instead of having to wait until it’s live to plug in everything. That was one of my favorite features! I like to batch tasks as much as possible, and it’s a headache to have to go back after a post is live to promote it. I’d rather do it all at once and then let it drip out over time!